Lose yourself on this enchanting island, where time stands still at the Cozumel Palace. Experience serenity as you and your wedding guests lounge out in the sunbeds, conveniently located at the infinity pool overlooking the ocean. Find your sense of adventure as this resort is famous for its snorkeling at the only inland coral reef in the world, just 3 miles offshore. Visit any of the nightly shows, like the extravagant fire show, or unwind while watching the sunset over the Caribbean Sea from the luxury of your own balcony in every room. 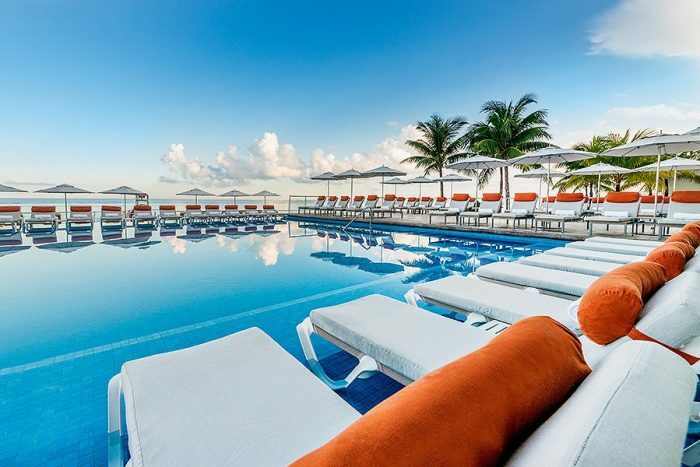 This resort was made for water lovers since you can learn to scuba dive, snorkel in the shallow waters off the shore of the resort or in the world’s second largest coral reef just past the shore, or sit back at the huge infinity pool! The San Miguel ferry runs frequently and will take you directly to downtown Playa del Carmen! The beach that is offered at this resort is a manmade beach. Free 1-hour private cocktail reception when booking 10 – 19 rooms. Free 2-hour private function when booking 20 – 24 rooms. Free private event time for up to 9 hours when booking 25 – 35 rooms. 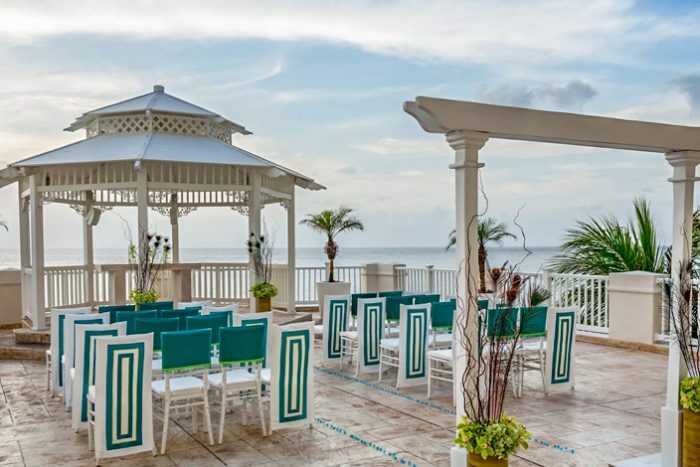 Wedding Gazebo – 50 guests max, North Beach – 50 guests max, South Beach – 50 guests max, Infinity Terrace – 50 guests max, Mirador Ballroom – 50 guests max, Sky Terrace – 32 guests max. The resort will host no more than 3 weddings per day Monday thru Saturday. Weddings can be held any time between 11am – 6pm, and no weddings will be held at the same time. Rooms range from $190 – $240 per person per night. Every room includes wifi, a double whirlpool tub, and a balcony with a hammock (except for certain ocean view rooms). Guests looking for ultimate luxury will enjoy the Concierge Level room that includes two 25-minute massages and a private beach lounge area with waiter service. Children 3 and younger stay free. 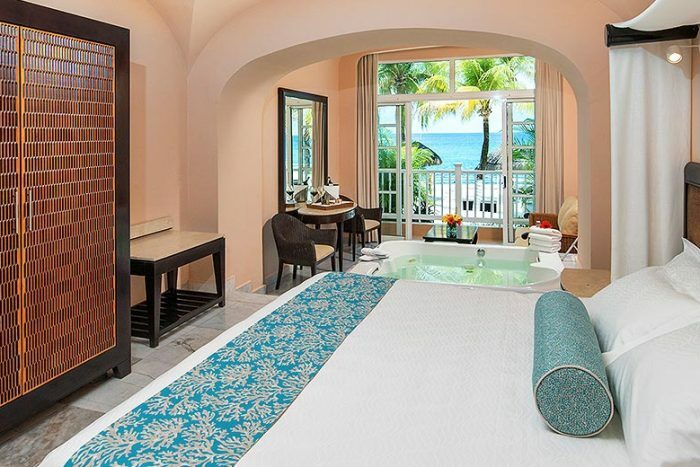 There are 163 total guest rooms with views of the Caribbean Sea. Certain room categories are oceanfront, and the loft suite room categories are the only rooms to offer separate bedrooms and living rooms. High-season months typically include January, May, June, July, December. It is always encouraged to have your guests book their stay 6 – 12 months in advance. Given the smaller property size, the resort has the chance of selling out during these months. All rooms allow up to 2 adults and 2 children max. There are adults-only rooms available as well, with 2 adults max. The Loft Suite is the only room to allow 6 guests, with 4 adults and 2 children max. Children are ages 4 – 17. The resort is 53 miles from the CUN airport, which includes a ferry ride that is about 45 minutes from the Playa del Carmen port. Q: What is your favorite part of a destination wedding for the resort? A: When all the family is coming from different places and make the hotel part of the happy reunion. 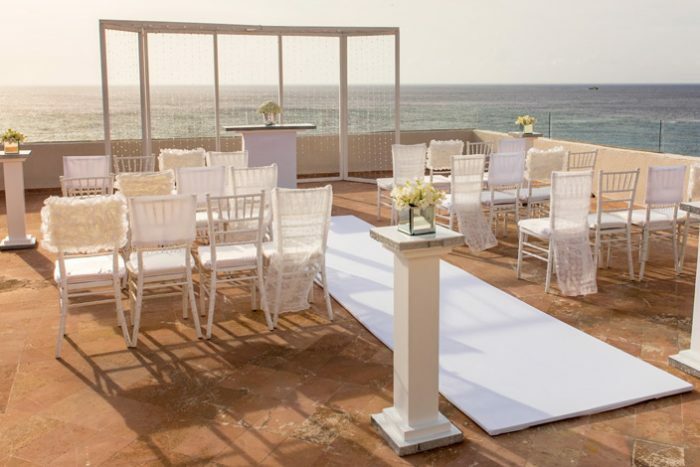 Q: What makes Cozumel Palace such a great place for a destination wedding? Q: What compliments do brides typically give about Cozumel Palace? 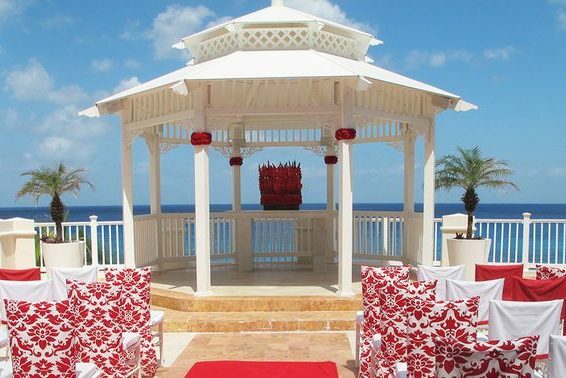 A: The incredible sunsets, which are picture perfect especially under the romantic wedding gazebo.